If you aren’t familiar with physicist David Bohm, he was one of the pioneers of Quantum Physics who dared to go beyond mere calculation. He dared to integrate quantum observations into a cosmology which includes consciousness. In many ways his ideas parallel my own approach. His term holomovement is very similar to what I have looked at in breaking down the word universe to its etymological roots. Both holo and uni refer to singularity-wholeness, the Absolute or solitrope. Verse and movement are related (re-verse, in-verse, ob-verse), although Bohm’s sensibility of holomovement implies a motorized realization of cosmos, while universe is a broader more ‘vers-atile’ ‘vers-ion’, allowing for the full range of information-theoretic-material realizations. Some other obnoxious portmanteau neologisms could include ‘soliwegh’, ‘monoteleos’, ‘unimotive’. Polarization is interesting to me because it supports what Bohm is saying. We use the term ‘polarizing filter’ for substances with these particular optical properties, but filters would not behave the way that these lenses do. As you can see in the YouTube, when it comes to these kinds of filters, ‘two wrongs can make a right’, so to speak. 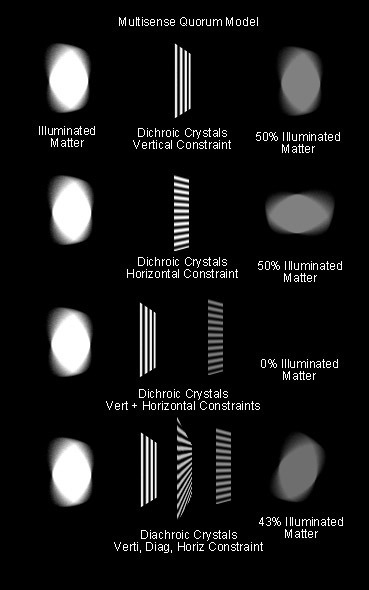 In my mind, there is no way that we can honestly describe photons as particles as we see that unlike a conventional filter, the amount of light passing through these lenses can increase as well as decrease the illumination of the target. It’s like having a second coffee filter which undoes half of the effect of the first. 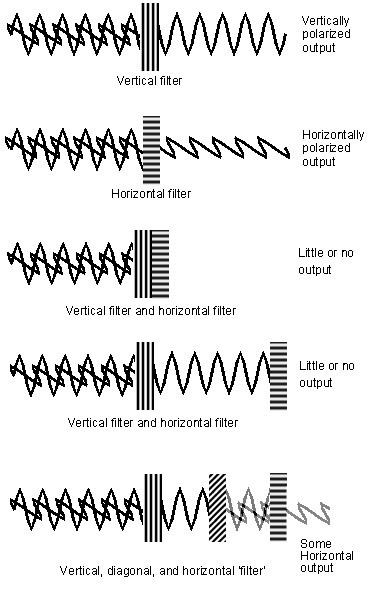 Following is a simple chart showing a conventional understanding of polarized light. Note that the source of the light and the target of the beam are not featured – symptomatic I think of the dominance of the theoretical approach to understanding light. We are meant to imagine quali-invisible waves which make up ‘light’ itself. traveling through the air and undergoing mathematical transformations. This is indeed a great way of modeling the phenomenon as an idea, but I think that the concrete reality of the thing, keeping in mind Bohm’s words about there not really being fundamental particles which autonomously exist, is obscured. My conjecture takes Bohm seriously and ventures further into realism. This new view suggests that rather than a generalized holomovement or implicate order, the materials themselves – light bulbs, laser diodes, dicrhroic crystal doped lenses and films, ordinary walls and screens…these are the materials which are the actual holodynamic ensemble. What they are made of all have sensory-motor properties which are both generic-universal, chemical-specific, and spatiotemporal-unique. Each element is a presentation of this ontological continuum, with topological peaks as an unrepeatable performance out of the plenum of the inescapable repetition of the permanently generic. Quantum is only half of the picture. Qualia is both the cause and effect of quantum. This next figure is a diagram to illustrate this idea of light or quantum, not as some mysterious invisible magic, or as a simple mathematical idea, but as a concrete sensory-motor reality. It may not be obvious, but what is intended here is to show that the actual agents are not waves but in illuminated matter: light bulb filament, lens, wall. It is the excitement of the filament which is imitated in different ways by the other participants in this ensemble. Each participating piece of matter is imitating or re-verse imitating, con-verting or di-verting not beams of light but their own energetic disposition. The molecules of the lens are responding in a specific way. The lens is changing its image, not bending a literal beam. The light which we see is a part of us interacting directly with a part of something else, separated only by empty space. Seeing is a way of touching without literally touching. While Bohm was ahead of his time (quote was from 1980) in recognizing the significance of holistic coherence and going beyond the model of autonomous particles, the view that I propose applies this same radical departure to perception. Just as the polarizing glass can either block out or recover signals, every sense channel we have brings with it its own unique contribution to our sense of realism. Our models of physics would not be the same if human beings were not primarily visually oriented. What we assume and what we question depends entirely on which sense modalities we rely on most. Consider then, that our human eyes are not special because they are eyes, but because they are eyes which have been executed on a fantastically human scale. Eyes can be simple. In zooplankton, we can see viable eyes composed of just two cells. Let this sink in for a moment. Eyes are simple. Vision is invertebrate simple. Plankton simple. No brain is required. It’s not much of a leap to imagine that rather than eyes being the only way to detect visible events, they are an evolutionary step in division of labor rather than perceptual simulation and optical detection. Chlorophyll shows us that response to visible light occurs on the molecular level, and ionization suggests this sensitivity is atomic. Neither of these imply, however, a separate currency of photons which autonomously transit between surfaces in a vacuum. Our own optical sense begins and ends at the surface of retinal molecules (vitamin A) embedded in the folded proteins of our rods and cones as they become erect in the presence of light. This is what our neurons are translating, not photons, but the cascading sensory-motor changes among molecules, cells, tissues, and organs that make up the living organism. Rather than a mathematical transduction of ‘information’, there are personal experiences of sub-beings (or sub-personal experiences of one being). Realize then, that although we as human beings cannot see without eyes, hear without ears, etc, it is arbitrary bias to presume that these human organs are the source of all sensory access in the universe. To the contrary, the multisense realism view proposes that primitive cells, molecules, and atoms, may possess a less differentiated sense capacity. Just as our human night vision loses the discernment of color sensing cone cells, it may be the case that all eukaryotes have a kind of stem-qualia, the root verse from which our hypertrophied modalities of sight, sound, tactile, olfactory-gustatory, kinesthetic-vestibular, etc. senses are descended. The molecular-atomic ‘inorganisms’ could have an even more primordial unisense, to the point of proto-tangibility. A level of experience in which spacetime, unity and diversity, semiosis itself begin to emerge from the void-bottom end of the Absolute. The light bulb filament’s molecules may themselves be bright and hot, maybe they are screaming and smell of ozone, all at once, but diluted into the catastrophe of fragments. On this least unified yet least diversified layer of uni-verse, the rules of community and locality are likely beyond our recognition. Every atomic whisper and supernova blast may be equally present in some sense at the bottom of the semantic event horizon. As Einstein warped spacetime and quantum mechanics digitized energy, this model extends that ambition to the Absolute. Perceptual relativity, seen as the ultimate and sole cosmological constant, crushes its own ontology at the periphery. Isness – being, collapses in on itself with the exhaustion of discernment.